Of course, over the past few centuries the aforementioned restrictions have largely been eased, and today the charging of interest on loans is widely accepted and expected in Jewish and Christian communities. This provides an interesting contrast with the other most prominent Abrahamic religion, Islam, which does not allow the charging of interest. Thus, banking for Muslims, especially more observant ones, is more difficult. This has led to the rapid growth of financial institutions in the Islamic world that conduct business in a manner that is compliant with Islamic, aka sharia, law. This includes Indonesia, where Islamic finance (iv) has thrived for the past few years, but there is a question of whether it can continue to grow and how it should be regulated. So, my article seeks to explain the history of Islamic finance and how it works, its presence in Indonesia, and provide an assessment of its future in Indonesia. Islamic financial institutions are a relatively new phenomenon. The first Islamic bank was created in 1963 in Egypt. (v) The practice subsequently spread to other Middle Eastern countries, most notably Iran, where all banks are required to be sharia-compliant and today 91 percent of Islamic banking assets are held by Egypt, Indonesia, Iran, Kuwait, Malaysia, Saudi Arabia, Turkey, the United Arab Emirates, and Qatar. (vi) Today the industry is worth two trillion dollars and is rapidly expanding. (vii) It is unsurprising that Islamic banking has a significant presence in the Middle East since it originated there and most of the world’s Muslim population lives there. However, it has expanded to places such as London, which functions as the main European hub for Islamic finance as the industry has grown almost 30 percent annually there, (viii) and is thriving in Asia as Indonesia is seeking to overtake the older and more developed Malaysian Islamic finance industry. (ix) Thus, it is essential to understand how Islamic finance works. Since the Quran bans the charging of interest, Islamic financial institutions have to make money other ways. Thus, these institutions offer financial instruments such as murabaha, which is when an Islamic financial institution buys something such as a house and the consumer buys it from the bank in a series of installments at a price higher than what the bank paid, so it can make a profit. (x) Consumers can also allow the bank to invest their funds in various business enterprises from which they share profits and losses, which are called wakala. (xi) There are many other financial instruments, but the most common and well-known are sukuk or Islamic bonds, which were first issued by the Ottoman Empire in 1775, and for which the holder of the bond owns a piece of whatever they are investing in and thus shares a percentage of the profits. (xii)(xiii) Typically, non-Islamic bonds pay an interest rate which varies based on the reliability of the issuer of the bond. However, since this is banned in Islam the result is sukuk. Of course, the implementation and regulation of all of the aforementioned financial instruments is much more complex and messy than it sounds. There are always debates about what is allowed, who regulates the industry, etc. For example, a 2009 study from the regulatory Accounting and Auditing Organization (AAOIFI) found that more than 85 percent of sukuk issued worldwide were un-Islamic. (xiv) One Dubai Investment banker even admitted that it is a common practice to go “fatwa shopping.” (xv) A “fatwa” is a ruling on Islamic law by a relevant scholar. So, in this context, “fatwa shopping” refers to the practice of searching for a religious scholar willing to rubberstamp a certain financial transaction for which they will be extremely well-compensated. Islamic financial institutions are forbidden from investing in businesses that are haram, or forbidden by the Quran. Of course, the question of what is haram is debated among Islamic scholars, but the most prominent examples of entities that Islamic banks cannot invest in are alcohol, pork, etc. They are not allowed to take part in gharar, or speculative transactions either. Defining what is speculative is difficult if not impossible, so it is susceptible to the aforementioned fatwa-shopping. In essence Islamic finance is a much more conservative undertaking. Its selling point is that it allows strict Muslims to conduct financial transactions guilt-free and is safer, although its effectiveness is debatable. (xvi) However, Islamic finance is still very appealing to a lot of Muslims worldwide, especially in Indonesia, where the system is underdeveloped and relatively new compared to other Muslim-majority countries. 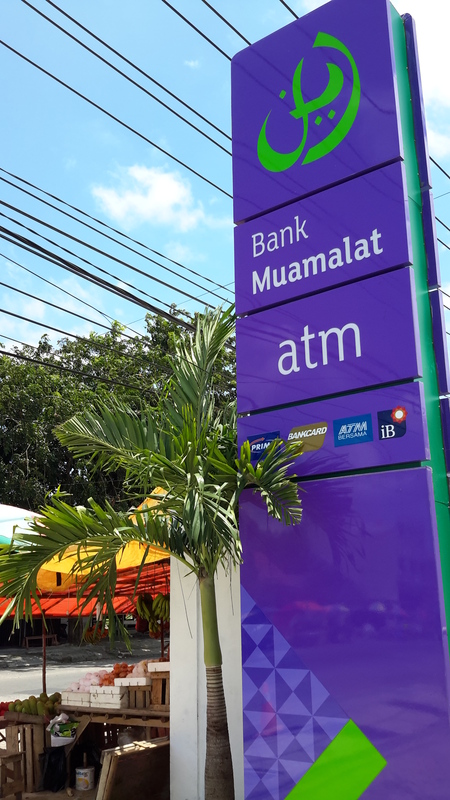 Bank Muamalat, one of Indonesia’s standalone sharia-compliant banks. Photo credit to Kelly Fitzgerald. Indonesia actually offered the highest return-on-investment among major Islamic finance markets last year as investors enjoyed 15 percent returns. (xxiii) Furthermore, Indonesia has the highest number of Muslims in the world, many of them relatively conservative, who are potential customers. There is a debate about the extent to which Islamic finance appeals to the average Indonesian, as many in the industry have clamored for the government to provide financial incentives in the form of tax breaks for Islamic finance to lure customers to mirror what Malaysia does. (xxiv) Of course, the question becomes what price the Indonesian government is willing to pay for Islamic banks to grow. If Indonesia chooses to heavily subsidize the industry the primary beneficiaries will be a small group of Indonesians as foreign ownership of banks is restricted to 40 percent, (xxv) but the people subsidizing this are Indonesian taxpayers. So, the Indonesian government has attempted to encourage the industry’s growth through less financially onerous ways such as proposing the aforementioned megabank. An Indonesian Islamic megabank has the potential to take advantage of the industry’s profitability, the country’s rapidly growing economy, and economies of scale, but consolidation alone does not ensure the industry can thrive. A single dominant bank could potentially stifle innovation, so it is essential that the planning and implementation of a megabank is done with the utmost care. There are still many issues to figure out such as whether the developing Indonesian Islamic finance sector should mirror the more liberal one in Malaysia or a more conservative model such as Saudi Arabia, and how it should be regulated. (xxvi) It appears that Indonesia is headed toward the former and will use a centralized regulatory agency, with the OJK and the National Shariah Board of Indonesian Ulema Council (DSN-MUI) sharing duties. The former will assume regulatory duties for the industries and the latter will make decisions what is haram. (xxvii) However, Islamic finance is still very much a developing industry in Indonesia and there is little consensus among Indonesian policy-makers how it should develop, other than that it should. I think one can make a strong argument that Indonesia is trying to position itself as one of the predominant Muslim-majority countries in the world. The government’s strong support of Islamic finance is one indicator, but it is not the only one, as in recent years the Indonesian government has gone out of its way to very vocally emphasize its commitment to Palestine, pushed laws restricting and outlawing vices abhorrent to Muslims, etc. So, it appears that Islamic finance will continue to thrive, at least in the short-term future, but its long-term future depends very much on how the industry develops now. A step in the wrong direction could potentially incapacitate the industry for the foreseeable future. (i) There are many different interpretations by relevant authorities of passages in various holy books about the charging of interest, but this article will not examine them in-depth. The reader should just be aware that this has been a hotly-contested topic for many centuries. (ii) “Welby Embarrassed by Wonga Links,” BBC 26 July 2013, http://www.bbc.co.uk/religion/0/23448808, accessed 8 March 2016. (iv) There are many different terms for Islamic finance such as sharia-compliant finance, Islamic banking, etc. However, for the purpose of consistency I will usually refer to the practice as “Islamic finance” in this article. (v) Simon Havey, “Islamic Finance,” Bloomberg View 10 June 2015, http://www.bloombergview.com/quicktake/islamic-finance, accessed 9 March 2016. (vii) “The Market for Islamic Financial Products is Growing Fast,” Economist 13 September 2014, http://www.economist.com/news/finance-and-economics/21617014-market-islamic-financial-products-growing-fast-big-interest-no-interest, accessed 9 March 2016. (viii) Amy Guttman, “London is Becoming the Newest Hub of Islamic Finance,” PRI 18 September 2014, http://www.pri.org/stories/2014-09-18/london-becoming-newest-hub-islamic-finance, accessed 9 March 2016. (ix) “Indonesia Lagging Behind Malaysia in Islamic Banking,” Straits Times 28 October 2015, http://www.straitstimes.com/business/indonesia-lagging-behind-malaysia-in-islamic-banking, accessed 9 March 2016. (x) Simon Harvey, “Islamic Finance,” Bloomberg View 10 June 2015, http://www.bloombergview.com/quicktake/islamic-finance, 9 March 2015. (xii) Leonard Bershidsky, “Islamic Finance Can Save the World,” Bloomberg 29 October 2013, http://www.bloombergview.com/articles/2013-10-29/islamic-finance-can-save-the-world, accessed 9 March 2016. (xiii) Please note the Ottoman Empire was merely issuing sharia-compliant bonds, not operating sharia-compliant financial institutions. (xiv) John Foster, “How Sharia-compliant is Islamic Banking,” BBC 11 December 2009, http://news.bbc.co.uk/2/hi/business/8401421.stm, accessed 10 March 2016. (xvi) There is a debate about how Islamic these institutions are and whether they are safer, e.g. less likely to fail, than traditional banks. One should bear in mind that Islamic banks are subject to the same economic upswings and downswings that non-Islamic banks are, and many of their investments are just as, if not more, risky than traditional banks. For example, they often face higher default rates for the loans they provide since many of them make loans to small businesses, which are riskier since they are more likely to default. However, this is a debate for a separate paper. (xvii) Jonathan Lawrence, “Islamic Finance in Indonesia: Past, Present, and Future,” K & L Gates 27 November 2014, http://www.klgates.com/islamic_finance_in_indonesia/, accessed 9 March 2016. (xviii) Tassia Sipahutar, “State Sharia Bank Merger Possibility in Spotlight,” Jakarta Post 6 January 2015, http://www.thejakartapost.com/news/2015/01/06/state-sharia-banks-merger-possibility-spotlight.html, accessed 9 March 2016. (xix) Megabank is a relative term, but I think it is appropriate for this article since this potential megabank would dominate the Islamic finance market in Indonesia. (xxi) I Made Sentana, “Government Aims to Spur Consolidation of Islamic Banks,” Wall Street Journal 27 May 2015, http://blogs.wsj.com/indonesiarealtime/2015/05/27/government-plan-aims-to-spur-consolidation-of-islamic-%e2%80%8ebank/, accessed 9 March 2016. (xxiii) Yudith Ho and Y-Sing Liau, “Indonesia Exploits Malaysia Shutdowns to Lure Islamic Investors,” Bloomberg 28 September 2015, http://www.bloomberg.com/news/articles/2015-09-28/indonesia-exploits-malaysia-shutdowns-to-lure-islamic-investors, accessed 9 March 2016. (xxvi) Jessica Gaddes and Jonathan Lawrence, “An Islamic Megabank for Indonesia,” K & L Gates 24 February 2015, http://www.klgateshub.com/details/?pub=An-Islamic-Megabank-for-Indonesia-02-24-2015, accessed 11 March 2016. This rings lots of bells: do the most profitable thing and make sure you square it with scripture. The absoulte cunning of the human race defies discription. Play with words long enough and you can prove anything.